Ah, Emirates! What a glorious airline. If you want an airline with tons of bling and showiness, look no further than Emirates. 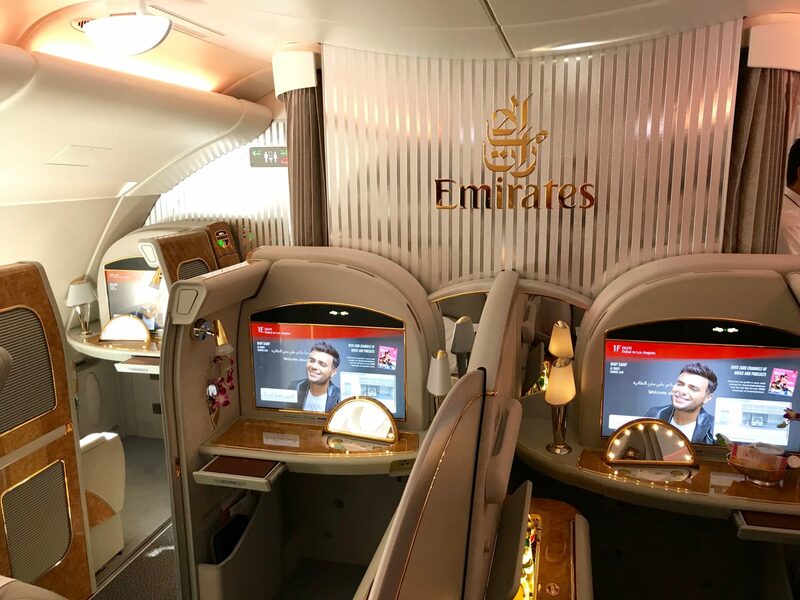 At UpgradedPoints, we’ve been lucky enough to fly Emirates multiple times, and it has continued to wow us no matter what — but it’s especially awesome in First Class! Emirates is probably the airline that pops into most people’s heads when people say the words “first class.” This is definitely a deserved reputation, as Emirates is and will continue to be one of the most dominant airlines in the world. Most people don’t know that Emirates flies to loads of U.S. airports, and they offer different seat types depending on what route you’re flying. Let’s get an analysis of the Emirates U.S. routes and their different aircraft. With the sole exception of Fort Lauderdale, Emirates’ route network and map are pretty straightforward with predictable aircraft that fly consistently to that destination. Check out this chart that summarizes which flight numbers correspond to the routes, along with matching aircraft, classes of service, and frequency! *Currently, the only 3-class 777-200LR flights are between Fort Lauderdale (FLL) and Dubai (DXB) on very specific days that are subject to change. If you’re departing from Fort Lauderdale, first class is available on Sundays. If returning to Fort Lauderdale, first class is available on Sundays and Thursdays. Using Japan Airlines miles is a well-known sweet spot to booking Emirates. Unfortunately, you will need to pay around $1,700 in fuel surcharges one-way for first and business class flights. Still, it may be worth it to save your points and miles. If you want to pay as little out of pocket as possible, using Alaska Airlines miles is your only option. You will only pay $19 one-way out of pocket, but the cost of awards will be dramatically higher. For example, a one-way flight in first class costs a whopping 150,000 Alaska miles! However, f you have the ability to earn lots of Alaska miles or Marriott points, it may be worth it. Other methods include using Korean Air miles or Malaysia Airlines Enrich miles. Let’s get down to the nitty-gritty of Emirates’ flight options! 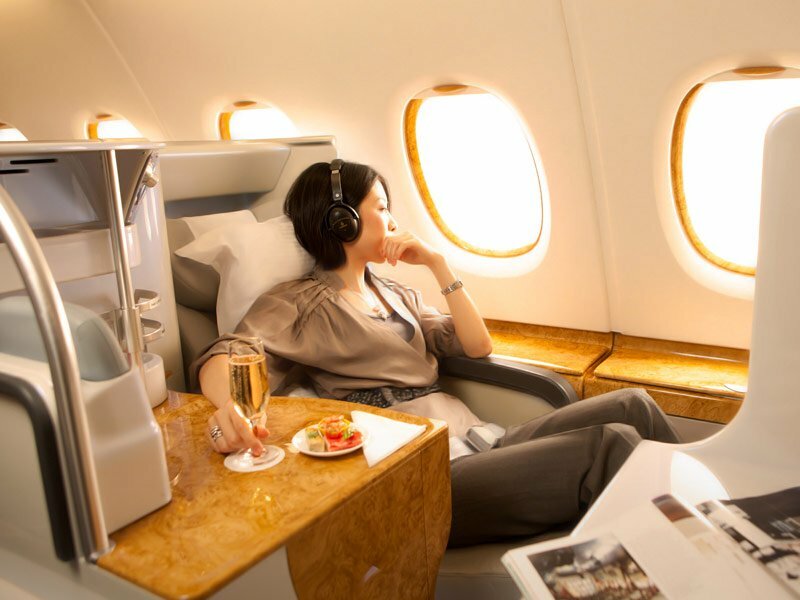 The oh-so-glamorous Emirates A380 First Class Suites is the best offering to/from the U.S! Image courtesy of Upgraded Points. Emirates offers first class on all their routes and all their flights, with one exception. The 777-300ER First Class Suites are much smaller than the A380/777-200LR First Class Suites. As a result, you definitely want to fly on option #1 in first class when you have a choice. The 777-300ER suites are 20.5″ wide and 69″ in pitch, while the A380/777-200LR suites are 23″ wide and 86″ in pitch (or 78″ long in bed mode). This is a huge real estate difference, which should solidify your choice. Emirates A380 first class seat map. Image courtesy of seatguru.com. As seen above, you will be sitting in one of 14 enclosed suites with sliding doors, an epic minibar, and some very blingy decor. These 14 suites are spread out across 4 rows with a 1-2-1 configuration. 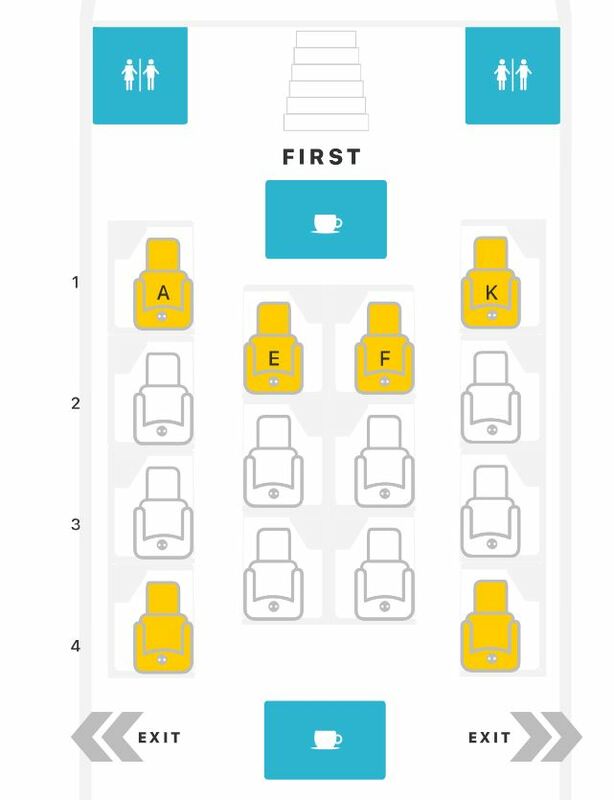 General consensus is that you want to be at least 1 row away from all galleys, so the best seats would be in rows 2 and 3, with solo travelers suggested to take window seats and couples to take middle seats. Let’s pivot over to the 777-200LR First Class Suites. Remember that Emirates has been in the process of retrofitting their 777-200LR cabins, so be aware that the following information might change at any time without notice. The 777-200LR’s either have 2 classes (business and economy) or 3 classes (first, business, and economy). The 3-class planes are the only ones with first class suites, so if you want to fly from Fort Lauderdale in first class, fly out of there on Sundays and return on Sundays or Thursdays. Emirates 777-200LR 3-class first class seat map. Image courtesy of seatguru.com. 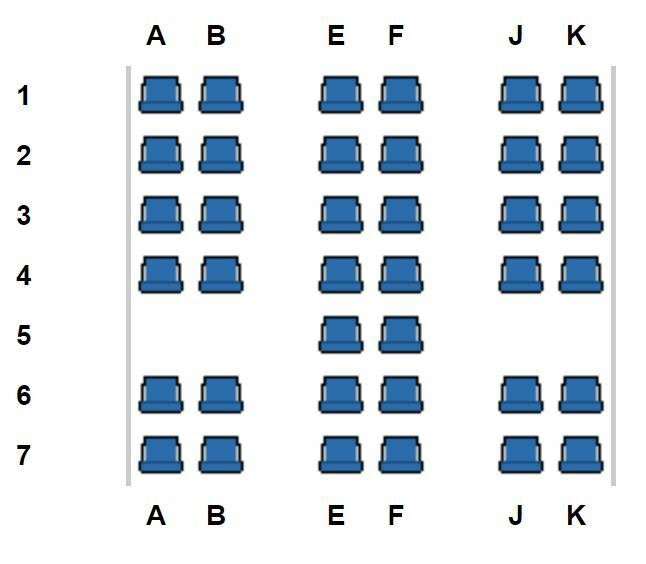 There are only 2 rows in a 1-2-1 configuration for only 8 seats total. This seating arrangement and cabin size is actually more intimate than the A380, which is great! Also, if you’re flying out of Florida, you have a route option that doesn’t force you to buy a positioning flight to somewhere like New York City (JFK) or Los Angeles (LAX). Bottom Line: If you want the full first class suites experience, we recommend flying on the A380, since there’s simply nothing quite like having the best seat on a huge aircraft like that. If you’re flying out of Fort Lauderdale or you desire a more private cabin, give the 777-200LR a thought! Just pay attention to departure dates, because first class isn’t operated every day. Try Emirates business class on the A380! Image courtesy of emirates.com. Let’s pivot our discussion over to Emirates business class. Although Emirates is known for their astonishing first class suites, a lot of their business class seats are very unimpressive. Let’s begin with the A380 business class seat. At first glance, you might think the A380 seat falls short of the hype due to its smaller width and pitch. But once you see the seat itself, you’ll notice a huge surface right next to your seat that you can use as an armrest or table. The A380 business class seat is our favorite for 1 reason: the 1-2-1 configuration. There’s just a lot more privacy, and you get direct aisle access with every seat. Yes, there are more seats on the A380 — but it’s also a monster of an aircraft. Emirates A380 business class seat map. Image courtesy of seatguru.com. Although SeatGuru says that the middle seats in row 23 are great seats, we actually think that the best business class seats on the A380 are in row 25. They’re as far from the lavatories as possible and 2 rows from the galley, which is a good compromise. Also, side seats in row 25 are window seats, not aisle seats, which is much more private. If you’re deciding between seats and row 25 is taken, remember that odd-numbered side row seats are window seats, while even-numbered side row seats are aisle seats. You generally want to stay far away from the lavatories, which in this case means near the back of the cabin. Your experience on the A380 is also much better because you get to enjoy the onboard bar, which is actually staffed instead of self-serve! Now let’s look at our runner-up for Emirates business class seats: the 2-cabin 777-200LR. Remember that the 777-200LR is only operated on flights to/from Fort Lauderdale (FLL). 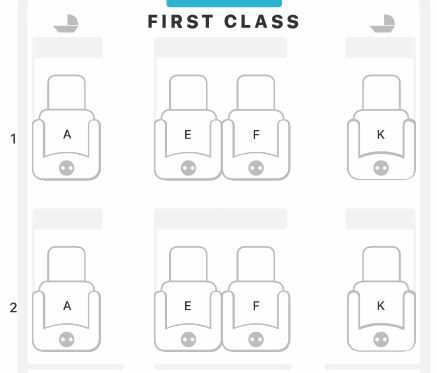 These business class seats are arranged in a 2-2-2 configuration, which provides direct-aisle access to most seats (with the exception of A and K). Emirates 777-200LR 2-class business class seat map. Image courtesy of expertflyer.com. The 2-class 777-200LR is offered on most flights to/from Fort Lauderdale (FLL), except for EK 214 on Sundays and EK 213 on Sundays and Thursdays. It is absolutely essential to remember this, since the 3-class 777-200LR offers comparatively horrible business seats, which we’ll see below. 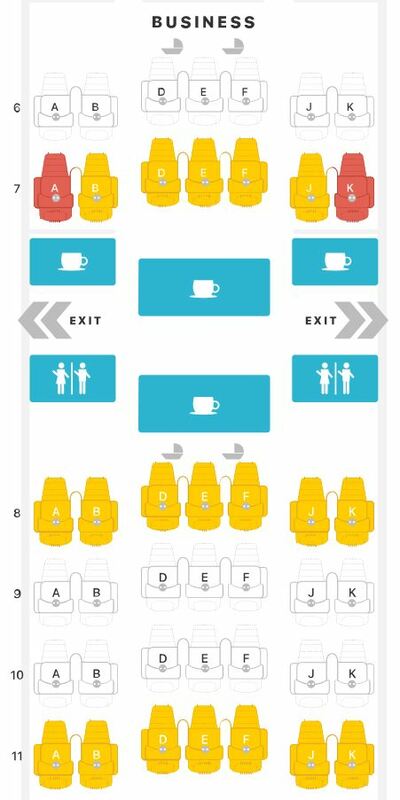 You generally want to select seats with the direct-aisle access, so opt for seats B, E, F, and J. The best seats on this new 2-class 777-200LR are in row 7, as there is no foot traffic behind these seats due to the lavatories being in front. The next seats we’ll look at are on the 777-300ER, which has the same exact seats as on the 777-200LR 3-class — the only difference is that the 777-300ER is flown to more places. Because of its expanded route network, the 777-300ER wins over the 777-200LR 3-class. We believe row 6 offers the best seats due to the distance from the lavatory. Nobody will be walking near your seat, since the first class cabin is in front and the lavatory/galley is behind you. The next best would be row 11 right in front of the economy cabin, which can get a little noisier (but will still have little to no foot traffic). The 3-class 777-200LR has an identical seating configuration. Bottom Line: In summary, fly the A380 for direct aisle access and the best overall experience. Fly the 777-200LR 2-class between Fort Lauderdale (FLL) and Dubai (DXB) for the second-best experience. If you don’t have a choice, fly the 777-300ER or the 777-200LR 3-class. Emirates doesn’t operate a premium economy cabin on any of their flights to/from America. Emirates A380 economy class. Image courtesy of dailymail.co.uk. As you’ll find out in this section, there are clear winners and losers when it comes to Emirates economy class. They have a great reputation for offering some cutting-edge ice entertainment, great service, and good food even in economy. Emirates A380 economy class seat map. Image courtesy of seatguru.com. Each economy seat on the A380 measures the largest at 18″ wide and 32″-34″ in pitch. These seats are arranged in a 3-4-3 configuration. As you can see, there’s several great seats and several bad seats. The best seats in economy on the A380 are 81A and 81K, with the second best seats being 68A and 68K. There are no seats in front of these, so you’ll have tons of room to stretch your legs out. Row 81 is superior to row 68 because it’s very far from the lavatories, minimizing foot traffic around you. Let’s move next to our runner-up, which is the 777-200LR. Although it is narrow at 17″ wide, the pitch of 33″-34″ is better than every other economy seat. Emirates 777-200LR 2-class economy seat map. Image courtesy of expertflyer.com. If you can, take the rows 39-40 side seats, which only have 2 seats per row! This means that if you’re traveling with a companion, you’ll have much more privacy. We recommend against seats 41A and 41B due to their proximity to lavatories. The 777-200LR 3-class aircraft has a slightly different economy arrangement, but the principle should be the same: aim for the rows that only have 2 seats per side. In this case, shoot for rows 35-36A/B and 35-38J/K. Emirates 777-200LR 3-class economy class seat map. Image courtesy of seatguru.com. Lastly, the “worst” economy seat is on the 777-300ER. The seat measures 17″ in width and 32″ in pitch, which is the smallest of all Emirates’ economy seats. We’d suggest you avoid this, but we also understand that it might not be a choice — since the most routes flown by Emirates to the U.S. use the 777-300ER. Emirates 777-300ER economy class seat map. Image courtesy of seatguru.com. Bottom Line: There’s a bit of sizing difference among economy seats in Emirates, but the winners are clear. The A380 has a few great seats which you should pick if you can. Second place goes to the 777-200LR due to increased pitch. Last place goes to the 777-300ER, which has the smallest seats. Overall, Emirates has some of the best first class products in the world. They have a range of business class products (some of which are terrible), and don’t yet utilize premium economy on their long-haul flights to America. We also talked about the differences in economy class, and there’s definitely some winners and losers here. In sum, we recommend picking the A380 for all cabins if your flexibility allows you to fly from an airport that uses this aircraft! 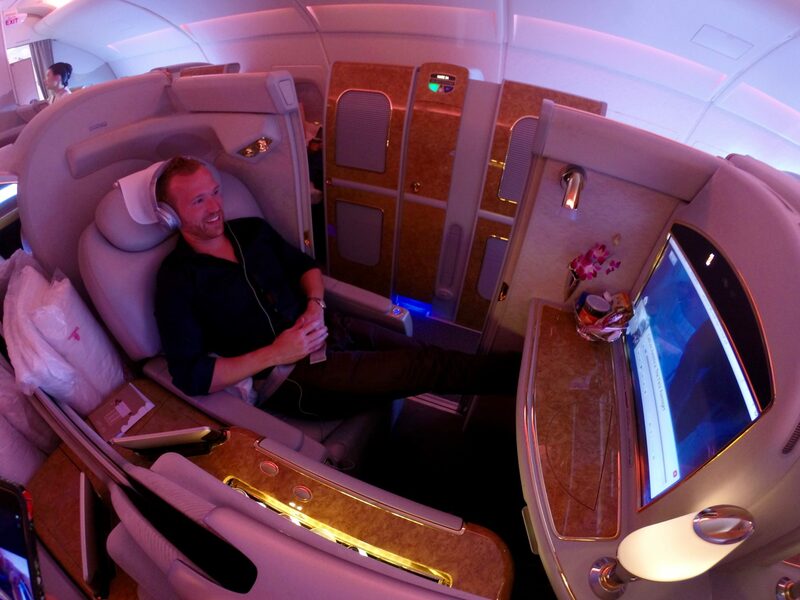 What are the best ways to book Emirates first class? We love using either Alaska Airlines miles or Japan Airlines miles. You can fly first class without surcharges using 150,000 Alaska miles one-way, which is steep but will save you $1,700+ on fuel surcharges. Japan Airlines miles cost less (depending on which airport you fly out of), but you’ll pay for all fuel surcharges. Check out our in-depth guide if you want to know the best ways to book Emirates First Class! What are the best ways to book Emirates business class? Again, using Alaska miles or Japan Airlines will probably be the best decision. Alaska costs 82,500 miles one-way, but you won’t pay any fuel surcharges. Japan Airlines varies and might be less, but you will pay up to $1,700 in fuel surcharges each way. See our detailed guide for more information on the best ways to book Emirates business class! What are the best ways to book Emirates premium economy class? Sadly, Emirates doesn’t use premium economy on their long-haul flights to or from America. This is actually going to change, but for now, there’s no way to fly premium economy on Emirates to/from the U.S.
What are the best ways to book Emirates economy class? Again, Japan Airlines or Alaska Airlines might be best in this case. We actually suggest using Alaska miles because you won’t pay surcharges. With Japan Airlines, you’ll be paying surcharges, which are hundreds of dollars. It seems counter-intuitive to use points and still have to pay cash. Alaska Airlines charges 42,500 miles each way for economy class flights between the U.S. and the Middle East. Thanks for the post! I really appreciate your site’s incredible guides to all points and airlines – it’s very helpful. However, on this one, unless I read it wrong, it’s a rather bad omission to leave out their new first class suites on the 777-300ER. Since coming out with Geneva and Brussels routes, they’ve added Frankfurt, London, Vienna and Tokyo. Thanks for reading! We are paying very close attention to the new Emirates First Class Suites on their updated 777-300ER. Unfortunately, these products aren’t offered to routes to/from America. As soon as this changes, we will absolutely include that in our guide. Thanks for reading!